My plane touched down in India early in the morning after 3 flights and 22 hours of travel. I was greeted by a driver holding a sign with my name on it. 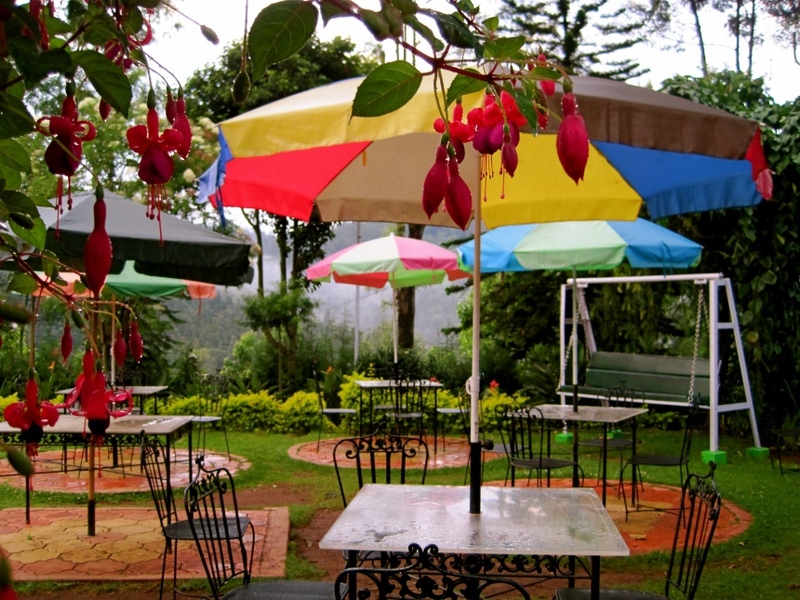 We quickly embarked on a 2 hour drive from Coimbatore airport to the town of Coonoor located high in the Nilgiri Mountains of Southern India. Our drive was one long, steep ascent with hairpin turns every 200 meters. It was dark, but I heard the trumpeting. Of the three English words the driver knew, he used 2 – “very, very danger”. A short while later we saw the remnants of a head-on collision (bus vs. truck) and numerous packs of hungry, mean-looking dogs bearing their teeth. After two hours of driving, we turned off of the main road and started down a dirt road in ill-repair. The driver was on and off the cell phone and stopped periodically to fuel on coffee or relieve himself. 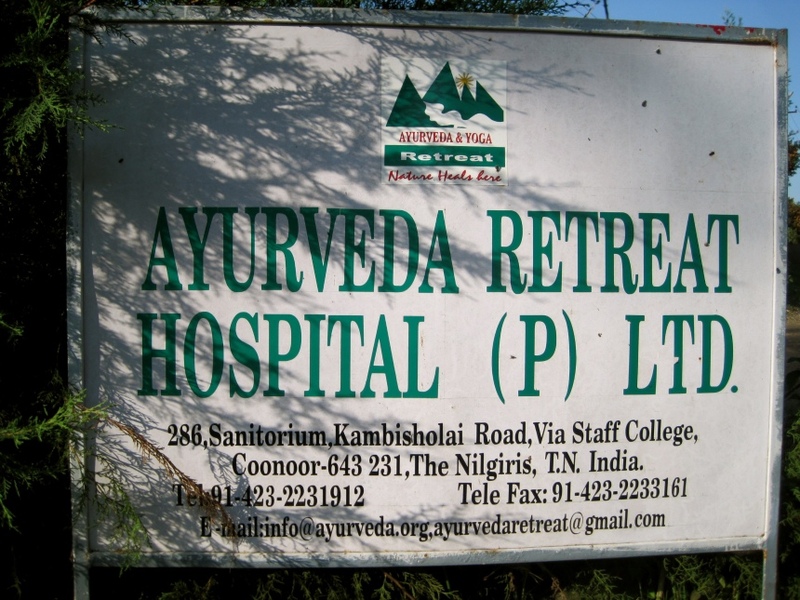 When we finally pulled into a driveway, I was relieved for 2 reasons- the sign said “Ayurveda Retreat” and I could tell we were truly in remote nature…the stars were magnificent. The night-guard marched me to my room, dropped my bags at the door, and promptly left. Welcome to India. It was 3 A.M. and, despite exhaustion, I couldn’t sleep. As I laid in bed, it sounded as if a circus of large animals was racing around on top of this small, shack-like building. Wherever I was, this was to be my new home for the next 6 weeks. Somehow I managed to fall asleep because the next noise I was aware of was the sweet sound of birds chirping as sunlight softly entered my room. I was naked, shivering, with tears welling up in my eyes and then I started to laugh too as the whole scene was so classically Western girl meets Eastern world. And, as I was feeling slightly in over my head and loving it all at the same time, I thus concluded that though it was only day one of my spiritual journey in India I’d already lost my mind. In that moment I had a flash of brilliance. I remembered how we used to clean ourselves in Nicaragua when the water ran out. We used the reserve water bucket and a small pail to bathe ourselves by hand. I used the bucket to make warm water by filling it halfway with the cold water and halfway with the super hot, scalding water. Then, with a small pail I ladled the warm water over myself and in this highly sophisticated way I gave myself my first shower in India. The courtyard as viewed from my bedroom door. Shortly after my modified shower, the breakfast bell sounded and I followed my nose to the delicious aroma of savory dosas. A chutney and warm spiced tea accompanied this dosa dish to perfection. I looked around me and realized, I was in heaven. 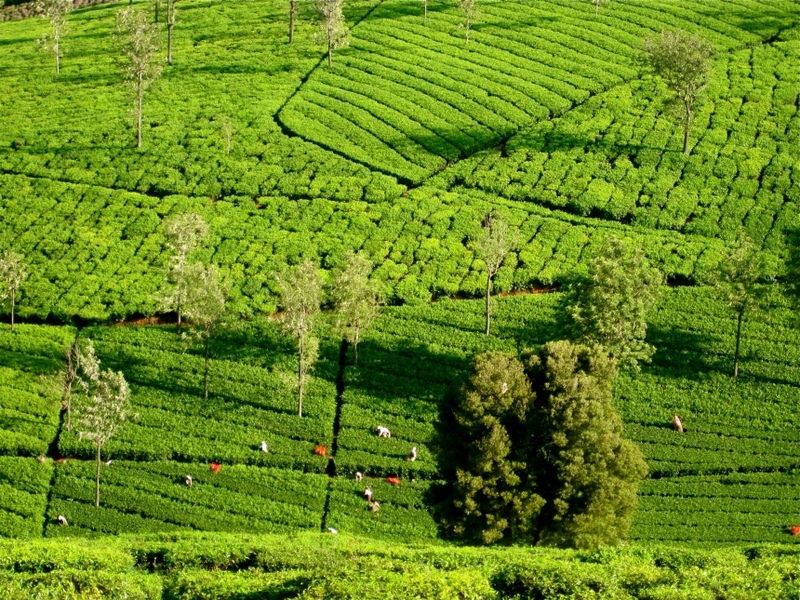 For as far as I could see, lush green tea plantations stretched out over undulating mountains and a big blue skies provided the most sparkling fresh mountain air. As I sipped the aromatic spiced tea and slowly savored my first experience of Ayurvedic food I was infused with such excitement, yet a serene feeling of calm all at once. For me, it was like arriving home to a place I’d never been but feel like I belonged. My experience at the Ayurveda retreat began like this and as the experience unfolded I fell more and more in love with the mountains of Coonoor, the beautiful people, and the magical teachings of Ayurveda. For 5 hours a day I studied Ayurveda with my guru, Dr. Sundar Raman. I was most fortunate to be his only student in the course and received one-on-one instruction from this highly accomplished Ayurvedic physician. Most of the classes were taught in a small tree-fort-like building nestled next to the garden and overlooking the tea plantations. The class notes were dictated to me in story form in the fashion of the traditional Gurukula (or school in which the pupil lived with the guru for 12 years of youth). Somedays, we would take a little “field trip” to the herb garden, or explore the surrounding acres on foot discovering medicinal herbs every few steps. As we harvested mother nature’s medicinal bounty it was easy to see the vast interconnectedness between us humans and the flora that surrounds us. 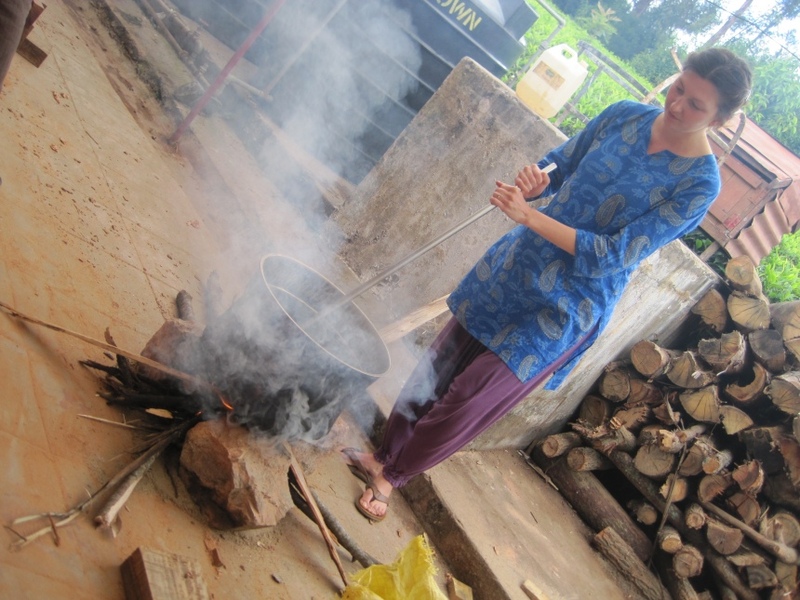 After the herbs were collected, Dr. Sundar taught me how to create medicinal oils and herbal formulations. I spent time in the dispensary with the Ayurvedic pharmacist mixing, grinding, and preparing the medications for the patients at the hospital. 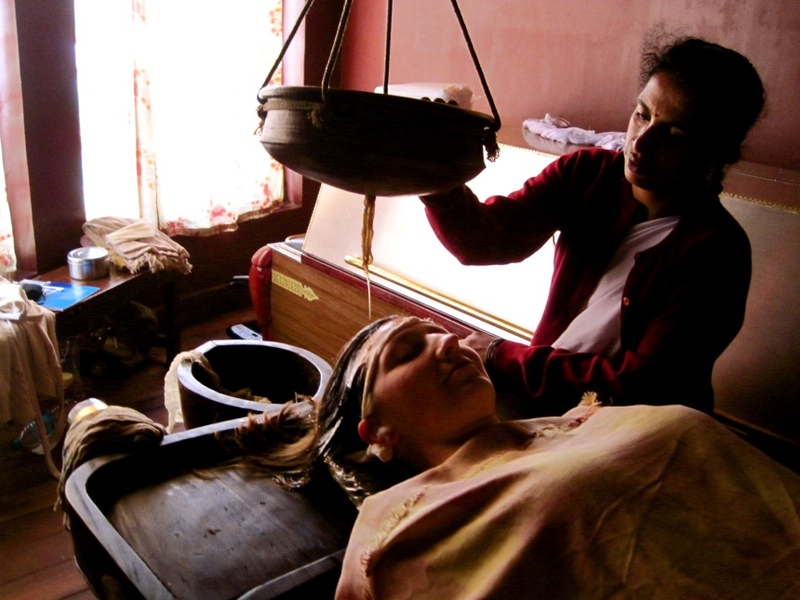 Some of the patients were there for 5 weeks to undergo Panchakarma (detox) treatments. They would arrive feeling achy, lethargic, or in some other way imbalanced and leave with their bodies and minds restored. Once a day I studied Ayurvedic Massage with Delma and Nila, two Ayurvedic therapists whose warm hearts and compassionate touch guided me through the details of treatments such as Abhyanga and Shirodhara. In Abhyanga, warm oils are massaged into your body through various sweeps and strokes rhythmically provided by two Ayurveda Therapists. Shirodhara is performed by a stream of warm medicated oil applied to the forehead and third eye to relax and rejuvenate the patient. I was lucky to experience both of these deeply relaxing treatments. Six weeks flashed by before my eyes and before I new it I was heading back down the mountain only this time I left in the morning and could appreciate the waterfalls and lush trees of the rain forest that accompanied my descent. Reflecting on my time at the Ayurveda Retreat, I realize just what a life-changing experience it had been. With daily yoga, Ayurveda, and meditation classes I had reached a deeper inner peace and felt more in tune with my body and mind. The knowledge to heal myself, as Ayurveda is known to be, is now another tool in my toolbox. With the tools of Ayurvedic diet, lifestyle, and massage I am now able to optimize my own health and empower others to do the same. To find out more about Ayurveda Click Here. Or, learn more about my Ayurvedic Coaching Sessions and how you can benefit from this healing medicine. Reading your journey to Ayurveda Resort in Conoor, Niligiris was enjoyable. The detailed description you have taken to reach this resort shows the determination others would not have ventured. 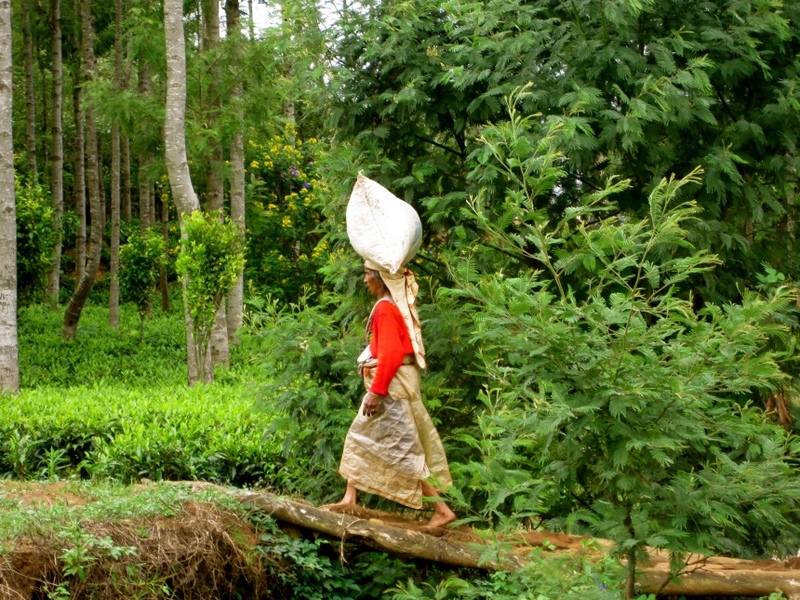 No other person would have taken such difficult journey to become an Ayurvedic specialist. yoga, receipes, is unique helping everyone to realize the benefits of Ayurveda. I had sent mail yesterday, requesting treatment for insomnia that is creating problems for me.